Fisticuffs it wasn't. Playground? You decide. Gutted at having thrown away a race victory, and allowing Lewis Hamilton in to clinch the world title with three races still to go, Nico Rosberg did not choose the best way to express his frustration. Slumped in a chair in the pre-podium room in Austin, Rosberg responded to Hamilton tossing him the second-placed cap by chucking it straight back at him. And proceeded to sulk publicly on the podium. 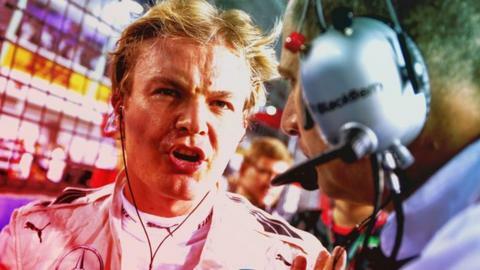 Beyond reasonable doubt, Rosberg had over-reacted to a gesture he had misinterpreted. "It is emotions and it is good. That's what F1 and racing is all about." Rosberg, Wolff said, was "angry with everybody, with the world, with Lewis, with himself. As a sportsperson you just feel like vomiting and the good or the bad thing about F1 is it happens under the eyes of millions of spectators." Rosberg's grumpiness was understandable. It was the final - and biggest - humiliation of a season of them for the German. But the reaction has been impressive - two straight wins. Can he keep it up next season and make the title battle more of, well, a battle?